and fakebaldur stated, “I hate the word ‘transmedia‘. It’s an overblown, pretentious and self-indulgent buzzword. It’s hypertext, damn it. Just like everything else” and followed up with “the only difference between ‘transmedia‘ and ‘hypertext’ is in the amount of hyperbole, gas and hot air being emitted”. And they all have a valid point. Transmedia is in danger of becoming a buzz word (if it isn’t already). 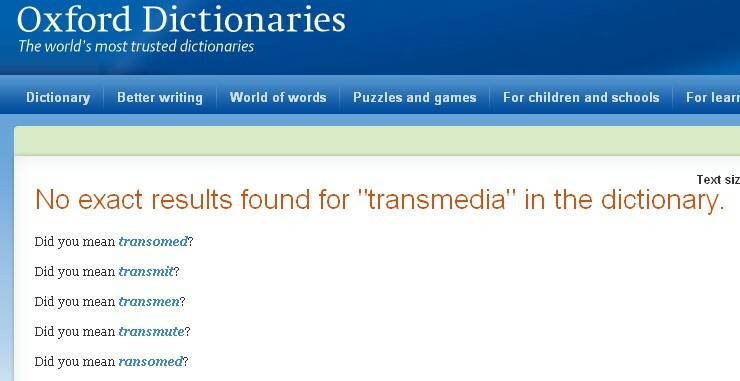 And never mind about the PGA accrediting the term ‘transmedia‘ – I’ve checked 3 online dictionaries to find that the word isn’t even acknowledged by the English language yet! So, going back to our Twitterers, they have a point. What IS transmedia? A noun? A name of something? or is it more of a verb? An experience, something you ‘do’? Either way, it’s in danger of becoming a victim of its own success because of the buzz. In the same way that anything that is overly hyped without amy commercial evidence of success, transmedia is being talked about a lot, but showcased very little in the public/commercial domain. The amount of ‘transmedia producers’ that are popping up all over web 2.0 on a daily basis astound me! I’ve been researching Transmedia Storytelling for nearly 2 years now for my PhD and still wouldn’t really consider myself a fully fledged ‘producer’ – doesn’t that come with experience over time? I was recently invited to be a guest at Seize The Media’s Transmedia NEXT 3-day workshop there were delegates already working on transmedia projects and yet, it seems the hype, the analysis and the buzz are still bigger than the sum of it’s parts. I feel the confusion is possibly because of the lack of commercial transmedia experiences. Go to your local pub, wine bar, coffee shop or school gates and ask who knows about The Art of the Heist, The Truth About Marika or Head Trauma. Check out who’s aware of Cathy’s Book or Level 26. I can see the blank expresssions already. The fabulous transmedia projects are still relatively ‘niche’ – still firmly rooted in ARGs and are so subtley rolled out, so fabulously supported by a strong architecture of strategy and knowledge of audience behaviours, that they aren’t trumpeted about as ‘The Next Transmedia Project’. I am pointed toward ‘new’ transmedia experiences on a weekly basis, often accompanied with a PDF or some kind of instructions offering ‘how to enjoy this transmedia experience. Click here to find out HOW’. Isn’t that like taking years to build a maze, only to supply a map? One of the huge challenges of scripting and storybibling great transmedia lies in the triggers that move audience from platform to platform seamlessly. There’s heaps of analysis out there looking at audience behaviors, UX, UI, platforms, primary platforms and narratives and how they all mix into the pot of creating great transmedia. The fact is that a transmedia experience will naturally move audience, progressing them across platforms – with relevance and almost subconsciously. The viewers/participants who entered The Art of the Heist by seeing the CCTV ‘footage’ of the Audi being stolen naturally weren’t surprised to see it reported in newspapers, featuring in car magazines. ‘Players’ who first came across the blog site of characters in The Art of the Heist were drawn to engage with the experience through blog links and might have came across the CCTV footage later. The point is, at no stage was a ‘map’ supplied. At no time was the magic blitzed by heralding this as a transmedia experience. The difficulty, the challenge, the toughest part of scripting great, successful transmedia IS the moving of audience from platform to platform without them knowing and BECAUSE THEY WANT TO. If you’re going to cut into manhours, resources and budget to create a great transmedia experience it should stand on it’s own BECAUSE IT CAN and needs no maps or promotion as a ‘transmedia’ experience. That just throws cold water all over it. and I think for helionetto who asked “Transmedia Storytelling? WTF?” I’ll point in the direction of the fab transmedia examples I’ve just mentioned. This entry was posted in Uncategorized and tagged buzz, hype, transmedia, twitter by storycentraldigital. Bookmark the permalink. To me it is like a bunch of people sitting around debating the meaning of the word “jazz”. You just know it when you experience it. Let’s leave all the pretentious BS alone. The whole biz needs better terms, and the market will eventually find them…but for now, we’re stuck with such mouthfuls as ‘transmedia”, ‘convergence” and “enhanced eBooks” (which I think we should just call ‘eeBs”). Hey David – great answer! And you’re so right – SO many people talking about it, defining ‘it’ and what we need is to see some commercially successful projects. Debate is healthy and really important to keep this on the money but too much talk and too little action just stagnates everything and we’re left with Centipede Syndrome – not knowing which leg to put first cos he just has so damn many! Better terms is vital – bang on! Maybe we can spin this out during our DBW Transmedia Webinar on 12th October? 21st media will develop it’s own language. The problem is that those of us creating across the whole spectrum now don’t yet have a solid enough vocabulary to describe what it is we’re doing. Neal – yes, it seems that 21st media is in need of coining a revised term for transmedia. Interesting too, that ‘transmedia’ is a ‘top down’ designation as that pigeonholes the entire ‘experience’ and constricts it immensely. I think that the best transmedia strategies work with a top down/bottom up structure, along with those rabbit holes to drill down, the spreadibility factor and then those lovely cheese holes that the audience fill in and create their own works of art! As I’ve been thinking about how to describe transmedia to people who have never heard the term before, I’ve started calling it “immersive storytelling.” It’s less about the media that we use and more about the effect of having pieces of the story show up as part of people’s real lives – in their social media accounts, using augmented reality to reveal pieces of the story in their own environment, on their mobile phones, etc… I’m sure I’m not the first to use that term, but I think people tend to grasp the concept more easily. Fabulous article and great comments by all. Can we take a vote and tally results for new name? We should be able to come up with something that doesn’t evoke such confusion and negative response. Immersive storytelling… sounds good, but immersive isn’t in the dictionary either. Hey Nerda, I like “Immersive Storytelling”… hadn’t heard that yet… very, to quote Alison, ‘bang on’! On the article – Although UX and UI consideration has become a core part of website and application design, a lot of (especially indie) productions I have seen do not value an intuitive ‘response-chain’ highly enough. It would help if web designers can get involved with transmedia projects in the early stages so they can give input to the structure and delivery methods of the storyworlds. A board game can have a rule book because all the physical objects of the game are present at the time of opening the box, an immersive story (nicely put by the way) should not. It is a process of layered discovery with the rules and narrative ideally entwined, intuitive and self explanatory (?). On the terminology – When explaining ‘transmedia’ to *real* people, they start to get what it is very quickly but I must admit verbalising the word makes me blush a little every time for the reasons already mentioned here. Off the cuff alternatives -> #immersive #immersion #immersivestories #storyworlds ??? #IST a good partner to #ARG ? A criticism of Transmedia really has a psychological/cultural issue at its core that involves fear AND requires a balance of compassion and harsh evolutionary movement/instruction. It is an issue that requires, as the motto of The Economist (a world champion of globalization), humanity “…to take part in a severe contest between intelligence, which presses forward, and an unworthy, timid ignorance obstructing our progress.” Monotheistic cultures often experience fear upon encountering polytheistic, trans-cultural, pluralistic perspectives and eco-systems. The fear of multiplicity within the psyches of monos is normal – like a child entering a large city alone. Again, the analogy is of a person from a small WASPy town in the MidWest entering New York, London, Paris, or San Francisco for the first time…or the Burning Man Festival. Or the complex and beautiful tapestry of a nation like India. “Roman Fever” sets it. Writers like Pico Iyer (Nowhere Man) and thinkers like the transmodernist Ziauddin Sardar (Mad World) understand very well the juxtaposition of mono and trans cultures. The fundamental principle of Sardar’s thought is that ‘there is more than one way to be human’. He goes on to emphasize the importance of “keep(ing) the future open to all potentials, alternatives and dissenting possibilities,” stating that, “…it is necessary to envisage alternative futures from different civilizational and cultural perspectives. Great post, thanks for the shout out to Art of the Heist! I think there have been great successes, but those successes aren’t identified as “transmedia” because the audience isn’t crying out for a word to identify it. Creators, educators, and marketers are, however. The seamless movement of stories across channels is natural for audiences, it makes sense, and it lives in “media” that are named already. People don’t identify Blair Witch Project as “transmedia” even though that’s what it was. They call it a movie, or a website, or a series of books, or comic books or they refer to the TV documentary, or they played the PC games, but they don’t think about how each piece adds to the overall story, it just does. The Matrix is another example. As you said, the best transmedia doesn’t require a map or guide to experience it, but we are still in early days, and a large part of the legacy of transmedia are Alternate Reality Games that do have complex structures which give explicit roles to players/audience requiring action. Eventually, it’s just the way it will be, and it won’t need a name. Good call – thanks – and I totally agree that it’s only the creatives, educators and marketers that are looking for a ‘term’. It’s interesting as I was just on a Storytelling/Transmedia panel for DigitalLA’s Social Media week and the same topic came up – the clunkiness of the ‘term’. I mentioned this post and the suggestion on these comments of ‘immersive storytelling’ and the delegates seemed to like it, so maybe time for some change? You mention the “seamless movement of stories across channels is natural for audiences, it makes sense, and it lives in “media” that are named already” and it totally makes sense – as, without realising it, we are already LIVING in transmedia modes. I agree with Michael wholeheartedly…although it can be fun to argue about semantics (I was an academic in a former life). However, there is now a buzz and hype about the buzz and the hype of the semantics. Ugh. At the end of the day it is a word. The word is transmedia. I like it. Maybe it isn’t the best word but the real fun and “issue” and work at hand is the experience. Call it “late for dinner” – does it really matter? Probably not.